Home / HT International Exhibitions / New Ideas for Your Next Trade Show Booth! As with any important event for your business, the way you present and design your trade show booth has an immediate and direct impact in your business! But the way you design it is a tricky and costly endeavour. Or is it? We’ve looked at all the new trends for 2019, talked to experts in this field and summarized our own experience from this last year and have created a short but efficient list of new ideas and trends you might want to consider when designing your next trade show display. 1. Make attendees the star of your exhibition stand! This trend is clear all over the business scene: we see ecommerce sites personalizing user experience and growing their conversion rates because they provide the potential customers with a personalized message. They are offering an unique experience for each individual. Why not to the same with an exhibition booth? Ford did a great job a while back at transforming the visitors into the star of the show for their exhibition stand. Attendees were encouraged to get behind the wheel themselves to be featured in their very own movie poster and trailer. This gave them a personalized experience and some fun memories to share with family and friends after the trade show was over. Of course, you don’t need to have Ford’s budgets and movie experts to pull something like this off. You just need to be creative and think of what would be a memorable and fun way for attendees to interact with your brand. Give them something to talk about and remember you by! 2. Interactive Flooring is the new hot trend right now! Remember the piano mat trend? It probably started to get traction with the movie Big and it was actually replicated many many times at different exhibition shows. Why? People can’t seem to stay away from it. Mostly because it is fun. So make sure you have a fun element on your floor! Something interactive or maybe just surprising. Incorporate sound, messages or lighting. Anything that would be relevant to your business and core message but also of interest to your users. Make it engaging enough and you may also be rewarded with some Social Media buzz. Why not, right? For some reason, people are hopelessly attracted to photo ops. Include some cut-outs and backdrop photo opportunities in your trade show booth. Why? People will be able to interact with them fairly easy and might even post them on Social Media if they are funny or clever enough. That means more exposure for your brand and who doesn’t want that? Just make sure you don’t over do it. Sure you want the pictures to be branded with your logo or event your promotional message. Just make sure it does not overpower the picture of the fun message. Otherwise, people will be reluctant to interact and post the picture. Why? By creating a nice and comfortable space for your attendees, they will want to spend more time at your trade show booth and therefore interact more with your brand or with your product. It’s really a simple strategy that can be very effective at any trade show but one that is sadly so often overlooked when it comes to the trade show stand design. Have some nice sofas or some comfortable chairs, serve some snacks and something nice to drink and ask them how their day is going. You can have a more “zen” approach by creating a soothing atmosphere and incorporating some water elements or maybe you can incorporate a park-like area for resting and enjoying some quiet time. Make sure it’s something that resonates with your brand and with your audience. Make genuine conversation and they will surely appreciate it. The more at ease they feel, the more time they will likely spend with your brand. We can all agree that optical illusions are nothing now. 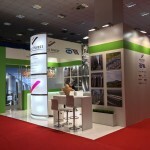 However, at an exhibition show one of the most important objectives is to capture your audience’s attention. How can you do that? Well, by incorporating a beautiful, creative or even wacky and fun optical illusion you are bound to make them talk about your trade show display, right? Maybe even create some Social Media buzz while you’re at it. It usually has the desired effect because it tends to intrigue your audience and make them come closer to see what they’re actually looking at. Make a floor seem to be rising, make a wall seem like it’s collapsing or make a product do something on it’s own. Just make sure it’s visible from a fair distance and then let natural human curiosity do its thing. Go big, or go home. You don’t really need to spend a lot of money but you do need to be creative and think of a strategic approach when it comes to engaging your attendees. Think outside the box, create an unique trade show booth and you’re going to have an amazing experience at your next exhibition!